These cannot be serious or realistic rules that any couple should live by. It sounds like a conspiracy of the Women's Lib Movement. Pass it on? No way! We are humans and humans have our basic rights. If we do not guard our rights, they would be taken away. So how can any men ever accept that their wife is always right? Especially when she may be wrong, sometimes? These rules are only meant for Minions in their cartoon world .... or is it? Truth be told, I did give those rules some serious thoughts after the retreat. The more I thought about them, the more I begin to believe that they aren't totally out of place. In fact, with a little tweak, they can become a strong foundation for every couple who wants to have a Maximum Marriage. 1. Your spouse is always right. read rule number 1 again. These rules work especially well when differences and conflicts rear their ugly heads in our marital relationship. Our pride and ego, more often than not, urge us to go all out to win arguments and establish superiority over our spouse and by so doing, secure the position that confirms that we are right. Those actions usually lead to more arguments and loud quarrels or silent cold wars between spouses. And finally, the winner is ...... no one. But the losers are the couple and perhaps their children. Every one who wants to have a fulfilling and meaningful marriage must learn to accept that life is not about always being right. I emphasized the word in italics because all too often being right merely means that we want to exert our rights. It is my right to be right!! We forget that fighting to be right, even if we were right in the first place, does nothing positive to build our marriage. From the experiences of many couples, losing small individual battles can eventually win the war for the couple. 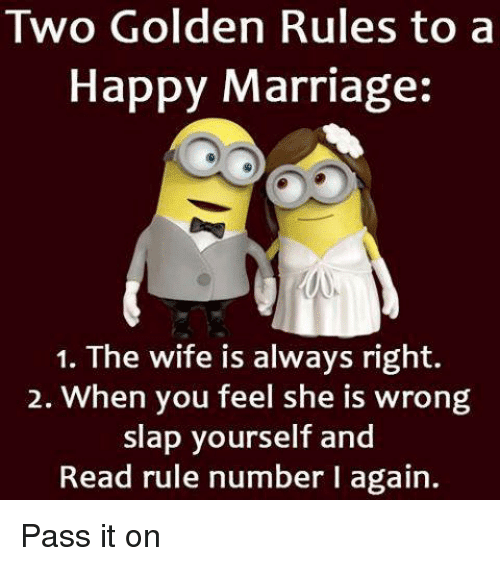 This is where Minions' Two Golden (Tweaked) Rules will work to strengthen a marriage. Whenever a difference acts up or a potential conflict begins brewing, it does well for both parties to accept that their spouse is always right. If we forget rule #1, then we must slap our self and read rule #1 again. I am not advocating that accepting that our spouse is right at that moment means that there is no possibility that he or she is wrong. I am clearly saying that these rules help us to stand on a solid foundation to manage the conflict. This starting position dissipates the heat and anger of that moment. It retards and stops negative feelings building up in our head and heart. Further more, it stops cynical and critical words from firing off our mouth. This is a great combat quencher and almost always stops conflicts from becoming a war. It allows one or both parties to cool down and think rationally at the problem instead of simply being angry at their spouse. When heads are cool and hearts are soft, then, the couple can use conflict management steps to effectively resolve their differences. So, Minion's Golden Rules to A Happy Marriage do work for humans ... provided both the spouses apply them equally. Start applying and be on your way to a Maximum Marriage.